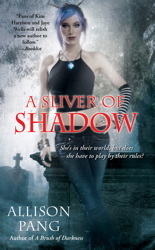 Allison Pang, author of A BRUSH OF DARKNESS and A SLIVER OF SHADOW recently blogged about covers over at Reading Between the Lines. She makes many excellent points, such as that publishers try to find a cover that will appeal to the widest audience, but two readers might react completely differently to the same cover. To prove it, grab a friend and check out this blog post on The Millions comparing US and UK covers. My co-worker and I, never short of opinions when it came to covers, looked over the different designs for titles like The Marriage Plot and The Tiger’s Wife. And unsurprisingly, we disagreed on most! I loved the chalkboard design of the UK Art of Fielding cover, while she found the chair to be distracting and preferred the clean typography of the US cover. One thing we agreed on is that the worst covers are generic, boring, or forgettable. Another shoreline? Another pair of shoes? Another headless girl in a ballgown? If you’ve seen one, you’ve seen them all, and I want to read none of them. That’s why I love Allison Pang’s cover so much: how often do you see a blue-haired heroine with a striped arm warmer? One bad pitch upends the lives of five people...this is why reading about sports is better than playing them. A young doctor in the Balkans unravels a mystery in her grandfather's past with the help of The Jungle Book. A trio of college students combine and recombine after graduation, in the acclaimed novel from the famously be-vested author. The first novel in the Abby Sinclair series introduces us to the OtherWorld. This UF features magical iPods, a Faery protectorate, and a miniature, pervy unicorn…so something for everyone?